ON THIS DATE (April 20, 2003) ... 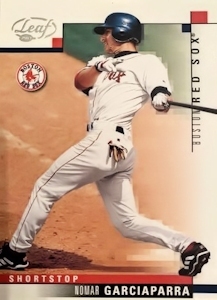 The crowd of 29,579 saw how it looked after the Nomar Garciaparra hit one into the bottom of a left-field light tower off Toronto reliever Cliff Politte in the 9th inning. A gaggle of Red Sox were swarming Garciaparra at home plate, laughing and leaping and celebrating their third last at-bat win in the course of a winning streak that now has reached seven. Sox 6, Blue Jays 5, when only 3 1/2 innings earlier the scoreboard Blue Jays 5, Sox 0. Whether you're speaking the King's English or the version they speak down under, that's one mighty fine comeback, especially since the Jays had their ace, Roy Halladay, hanging those zeroes on the Sox. No pain, either, for starter Casey Fossum, who was in the clubhouse watching on TV. Even before his home run, which came on a 1-and-1 cut fastball from Politte, Garciaparra had taken the lefthander off the hook with a tying two-run double in the seventh off Halladay, a 19-game winner last season who has yet to win in five starts this season. Late-inning comebacks can be habit-forming. The Sox did it twice earlier in the streak against the Devil Rays, and with The Committee holding another closed session yesterday, Ramiro Mendoza turned the boos that greeted him to cheers with a scoreless seventh, and Mike Timlin punched out four Jays in a six-up, six-down two- inning stint, the Sox made the most of a chance to do it again yesterday. Manny Ramirez had the day off until Grady Little summoned him to pinch hit in the seventh. He was intentionally walked, and was on-deck when Garciaparra connected with his winner. Giambi, batting .143 entering the game, drew the start in left, and his home run off a gassed Halladay ignited the Sox bench. It also sets a manager to grinning.